Erythropoietin (EPO) has multifactorial positive effects on health and can be increased by intermittent normobaric hypoxia (IH). Recommendations about the intensity and duration of IH to increase EPO exist, but only for young people. 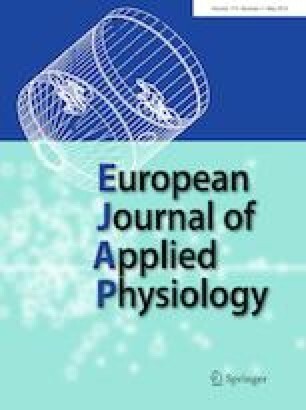 Therefore, the aim of the study was to investigate the dose–response relationship regarding the duration of hypoxia until an EPO expression and the amount of EPO expression in old vs. young cohorts. 56 young and 67 old people were assigned to two separate investigations with identical study designs (3-h hypoxic exposure) but with different approaches to adjust the intensity of hypoxia: (i) the fraction of inspired oxygen (FiO2) was 13.5%; (ii) the FiO2 was individually adjusted to an oxygen saturation of the blood of 80%. Age groups were randomly assigned to a hypoxia or control group (normoxic exposure). EPO was assessed before, during (90 and 180 min), and 30 min after the hypoxia. EPO increased significantly after 180 min in both cohorts and in both investigations [old: (i) + 16%, p = 0.007 and (ii) + 14%, p < 0.001; young: (i) + 27%, p < 0.001 and (ii) + 45%, p = 0.007]. In investigation (i), EPO expression was significantly higher in young than in old people after 180 min of hypoxic exposure (p = 0.024) and 30 min afterwards (p = 0.001). The results indicate that after a normobaric hypoxia of 180 min, EPO increases significantly in both age cohorts. The amount of EPO expression is significantly higher in young people during the same internal intensity of hypoxia than in old people. None of the authors have any conflicts of interests.